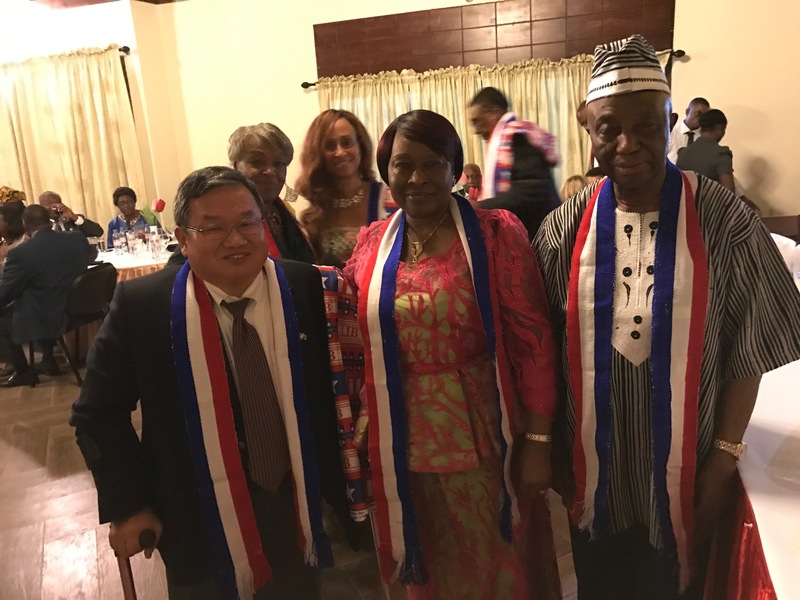 Steve Stirling, President & CEO of MAP International, Ellen Johnson Sirleaf, Liberia's first woman president (front row) and Cynthia Blandford, MAP Board Member and Honorary Consul General, The Republic of Liberia (back row, right) attend a ceremony in Liberia. The rebuilding process was underway when the horrific Ebola virus hit the nation of 3.3 million people. The health system was in ruins after the civil war and the nation was rebuilding the infrastructure when the Ebola virus hit in 2014. MAP International’s Liberia staff of seven people was ready to respond in March of 2014. MAP provided more than 30,000 personal protective equipment suits (PPEs) by April, 2014 to health workers in Monrovia. The protective equipment was quickly followed by containers of medicines (antibiotics, oral rehydration solutions, analgesics) and medical supplies to help save lives. Everywhere we traveled on this trip there were signs and reminders that Liberia is now Ebola free. About four hours from Monrovia, Liberia’s capital, is Ganta, home to the Ganta Rehabilitation Center. 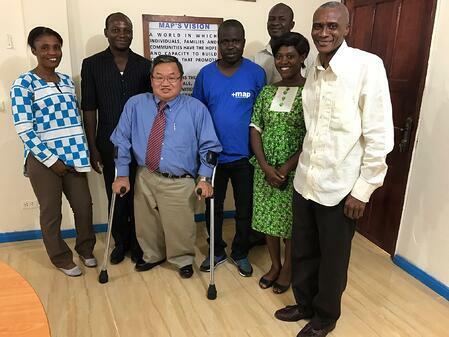 MAP provides the rehab center with training, medicines and medical supplies to treat people afflicted with leprosy, buruli ulcer (BU) and tuberculosis. On the day we visited the center, there were 30 patients (many In wheelchairs or on crutches) waiting to be treated by the dedicated healthcare workers, doctors and nurses. The rehab center houses about 150 patients who are recovering from the devastating diseases. Against all odds the healthcare workers are providing excellent care to these patients in a loving and gracious way. The patients who, might have been depressed from their ailments, were singing songs of thanksgiving with joy to our Lord while waiting to be treated. President & CEO Steve Stirling with hospital staff. Our next stop was at the Phebe Hospital in Bong County. Dr. G. Gorbee Logan met us with his staff and shared the good work being done. MAP provides training and medicines, while our partner, MedShare, provides the medical equipment. At the end of our meeting, Dr. Logan told us about a group of forgotten people who live in a former leprosy colony, so we decided to visit them. Visiting MAP programs in Bong County. When we arrived we were met by smiling and happy children. First it appeared to be a normal village, and then we met a number of men and women who have survived leprosy. While they were cured of leprosy, the horrific disease had left them disabled and disfigured with missing toes, fingers and limbs. 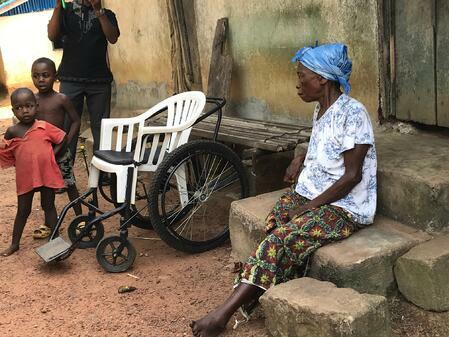 Because of the societal prejudices and beliefs against people with disabilities, particularly those inflicted with diseases such as leprosy, these people were excluded and shunned by other villagers. There were three generation or more living in the village of approximately 300 people. Children born to parents who survived leprosy were also shunned and excluded. I'm reminded of the story in John 9:1 when disciples and Jesus, "why was this man born blind, did he or his parents sinned?" Jesus replied, "neither his parents or he sinned but God allowed it to happen so Hi glory may be shown in the blind man." The third place we visited was the Kingdom Care Medical Center in Monrovia, a humble but clean facility, and an oasis of hope for people in need. We were met by Dr. Martha Zarway, her husband, and staff. In. The Center is equipped with an operating room, birthing room, a small lab, and a pharmacy, where medicines and supplies have been donated by MAP. Every other month Dr. Zarway packs up a mobile clinic to serve villagers who are too far away to come to the center. President & CEO Steve Stirling visiting MAP Liberia staff and programs in Monrovia. We asked the doctors at the three centers we visited what can we do to help and they told us they need training, more healthcare professionals, medicines, supplies and medical equipment. We are so glad that MAP staff in Liberia can help in these areas and that MAP shipments of medicine are put to such good use. But, of course more is needed. I want to thank each of our donors, board members, staff, and partners who make possible for people all over the world to have access to life saving medicines and supplies. There is much hope in Liberia as people of this nation have prevailed through much. They pray fervently to God for help and they have the resolve to work towards a better future for all Liberians.